I was asked for my thoughts on how best to influence the future development of British kendo and came to one simple conclusion – ensure that our dojo leaders are equipped to pass on practical and theoretical knowledge to their students. Traditionally the transmission of kendo knowledge is from teacher to disciple. A novice would seek out a master and place himself completely in his care. Usually no outside influence would cloud the relationship until the student had grown into a capable swordsman; in effect completing the shu stage of shu-ha-ri. Such an important relationship was based on mutual trust and kendo history is peppered with stories of would be deshi waiting for days outside dojo doors or being made to undertake months of menial tasks before picking up a sword. In return the teacher was expected to know all there was to know about the practice and philosophy of kendo. Today’s reality is very different. Newbies can join “taster” classes at their local sports centre or sign up for kendo amongst a list of other activities at “freshers” when they start at university. The chances are that the leader of these classes may also be at a relatively early stage in his or her kendo career, so it is a matter of learning together. Come to think of it, some of the great Hanshi confess that “teaching is learning”, but back to the point, it is not unusual for dojo leaders outside Japan to need occasional help in filling gaps in their own knowledge to enable them to give the best to their students. The syllabus for the ZNKR’s Kyoshi examination concentrates on transmitting correct basic technique information through shinai keiko, kata and the bokken ni yoru keikoho. It also focuses on correct reiho and attitude and most importantly talks about the instructor as a role model. I have been particularly privileged to have studied with several senior teachers who have influenced not just my kendo but how I want to live my life, but very few of us can even hope to emulate such positive influencers. Instead we have to do our best with what we have. It is said that you can identify an instructor through his student’s mistakes, so it is important that as instructors we continue to seek knowledge and develop our own kendo. Of course we can brush up on theory with books and on-line resources, but to improve technically and to really understand how the philosophical elements of kendo connect with the physical we need to find our own teacher. Few of us can put our lives on hold while we travel “to sit at the feet of a master”, but we can attend seminars or invite teachers to visit our dojo. For students and teachers alike kendo is nothing without continual learning. The ZNKR results page just came live – I passed! Thank you everyone for your good wishes. I returned last night from my four day visit to Japan. This was a brief but enjoyable experience, having been taken excellent care of by my friend and host Itagaki- san. I managed to catch up with a few old friends and had 3 excellent keiko sessions; with Chiba-sensei at Hitotsubashi Daigaku, at the civic dojo in Machida, Kanagawa-ken and on my final evening at Shibuya kenyukai. 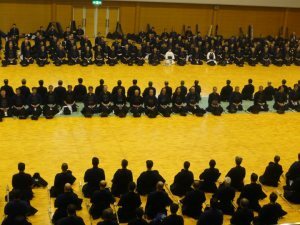 With many people preparing for the 6th 7th and 8th dan grading examinations next week, the level of kendo was excellent. Whilst I had the chance I broached the subject of shibori in tenouchi with a number of hachidan sensei and got a unanimous – “not necessary”. The kyoshi examination itself was interesting to say the least. There must have been close to 150 candidates. Only six of us were not Japanese. The other 5 were all people I knew from France, Belgium, Switzerland, Holland and Hong Kong. We had been given the examination topics which included kendo philosophy, instruction methodology, refereeing, kata and kendo general knowledge to study in advance. There was also a requirement to write an essay on a subject to be given on the day. The actual examination session was well organised by the ZNKR and there was an English speaking official on hand to help non-Japanese speakers understand the process. The examination was broken down into two papers to be completed in 2, 50 minute sessions with a sixty minute third session allowed for the essay. We had been informed in advance that the first two papers were to be completed either on a multi-choice or written answer basis. When the papers arrived the non-Japanese candidates all looked totally surprised. The format was indeed multiple choice, but very different to multiple choice as we understood it. What we actually received were large blocks of text from the study material with key words and phrases removed and substituted with numbers, then on the page following the question, a list of phrases with corresponding letters was shown. We had to put the correct letter against the matching number. Some of the options were similar and would have made sense in several places, our job however was to match the exact word to the exact location. Comparing notes after with my European friends, we had all prepared in the same way, by reading the material and trying to remember the concepts rather than the words. I had in fact tried to go beyond the prescribed texts and read Victor Harris’s translation of Ogawa Chutaro’s teachings and Noma Hisashi’s kendo reader, so the placing of letters against numbers boiled down to common sense and guesswork. Hopefully I got more right than wrong. Talking to Japanese friends afterwards, it appears that this is the normal Japanese examination approach. However although I had spent a fair amount of time in Japan in the past, my only examination experience was taking the test to convert my British driving licence into a Japanese one, which consisted of an eye test and jumping up and down on one leg to demonstrate coordination. Whist an interesting experience, this was perhaps not a good indicator of what to expect for the Kyoshi test. I did manage to anaesthetise the shock by going straight to a great keiko session in Shibuya followed by a drinking party, so it is now a matter of sitting back and waiting for the results. 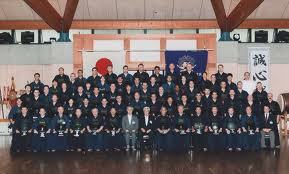 One of my early posts when I started this blog, lamented the fact that the All Japan Kendo Federation Kyoshi shogo could only be gained through a written examination in Japanese, http://wp.me/stBQt-kyoshi. Since then the wheels have slowly been turning and from November of this year the examination can be taken in English as well. 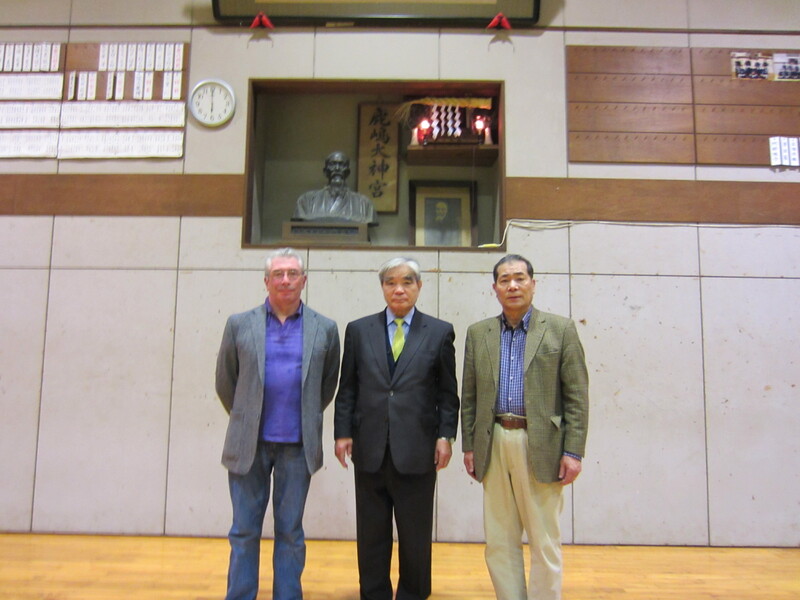 Some countries including the U.S.A and Germany have developed their own shogo system and do not see this as particularly exciting news, but for British kendoka who are reliant on the International Kendo Federation for grade and shogo recognition, this is a major move towards equality with our Japanese counterparts. Personally, having held Renshi for 12 years and 7th dan for nearly 5, I welcome the opportunity to develop my kendo career, but as they say “be careful what you wish for”. I was recommended as a suitable candidate to take the examination by my peers in the British Kendo Association earlier this month and the appropriate paper work has been sent off to Japan. The difference between the new systems and the old, (Kyoshi was formerly open to non-Japanese kendoka by recommendation alone), is that now, Kyoshi examinees need to go to Tokyo to physically take the exam. So this November I will have the pleasure of meeting old friends in Tokyo and getting some great keiko opportunities, but the main business of the visit will be a 3 hour written examination. The AJKF, have provide a detailed briefing document covering the examination questions and the relevant reading list, so I know what is expected of me. I have sent off and received my order from their online bookshop and I am now wading through the latest edition of Guidelines for Kendo Shiai and Shinpan, Training methods for Fundamental Kendo Techniques with a Bokuto, Nippon Kendo Kata Instruction Manual and the new Official Guide for Kendo Instruction. The latter is brand new and is a really well thought out book, excellently translated by Alex Bennett. Looking at the subject matter it is clear that the emphasis of the exam is not just on technique, but there is a strong need for candidates to demonstrate knowledge of the philosophical aspects of kendo. Most importantly, the examination seems to looking for evidence of understanding of reiho or reigi saho, (the demonstration of etiquette) and its contribution to developing the whole person. With application and registration fees, (if I manage to pass) and the cost of a trip to Japan, the new Kyoshi exam has to be taken seriously by applicants. I like the fact however that the content of the exam sets out to measure that instructors have the same depth of knowledge about all aspects of kendo regardless of where they live. Now I just have to ensure that I keep reading and revising and get the questions right on the day. I have tried to studiously avoid contentious or political posts since starting this blog, but there is one glaring anomaly in the shogo system that i feel is worth airing. Most of you know that in addition to the kyu and dan system of grading, there are three shogo grades – Renshi, Kyoshi and Hanshi. These are said to be a measure of suitability as a kendo role model rather than the technical ability measured by kyu or dan. There is however a correlation and currently 6th dans are elligible for Renshi, 7th for Kyoshi and 8th after some considerable time for Hanshi. 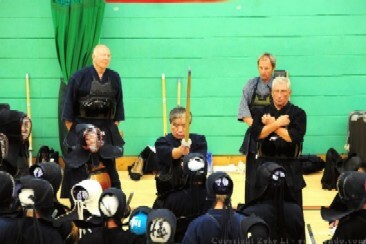 Like many aspects of kendo this has changed several times over the years. I believe originally, as with Naginata, the grades went only to 5th dan and the shogo were a measure of further development. Later it was possible to gain Renshi at 5th dan, Kyoshi at 6th and in rare cases, Hanshi at 7th. Originally these shogo were granted on recommendation by the relevant prefectural or country association and confirmed after examination of each candidates kendo cv by the ZNKR. Several years ago the method of qualification was changed. Hanshi is still awarded by recommendation and election, but Renshi and Kyoshi are gained by submitting a written thesis. So far so good! Where in my view things become a little unfair is that the Renshi paper must be submitted in English or Japanese, which is hard on folk who’s first language is neither. Worse still, (for me at least), is that the Kyoshi paper can only be submitted in written Japanese, which is pretty daunting even if you speak the language. The ideal candidate for Kyoshi is therefore a native speaker with the benefit of a Japanese university education. This then starts to give us a two tier, (maybe three tier system) 1, Japanese 7th dan Kyoshi, 2, Foreign 7th dan who were awarded Kyoshi before the change of rules and 3, Foreign 7th dan Renshi. The dissadvantages for the latter group are not just that they will perpetually be lower in the pecking order than their Japanese writing counterparts, but confined to the Renshi group in the Kyoto Taikai and other danbetsu events. There were discussions some time back, coming from the German Kendo Federation about establishing a European Kyoshi qualification, but to me, this sounds divisive and just a way of highlighting an “us and them” scenario. Having gone through the stringent ZNKR and FIK dan examinations it seems unfair to have to drop out of the system at the shogo stage.